The signs and guidance that you seek are all around you. The Universe works through people and if you stop to pay attention, there’s a theme that emerges from interactions, blog posts, quotes on social media and even the movies or shows you watch. Get out of your head and start paying attention. So many times what we want is for the limo to arrive at our doorstop, to drop us off at the Academy Awards, to just have to walk up on stage and accept the Best Actress Award. Forget the 10,000 hours to master the craft. Forget the lumps and bumps of lessons along the way. Forget the time it takes to make the right connections, to promote ourselves, to find an agent, to go on casting call after casting call, hearing “sorry, but your not what we are looking for”. The universe is not outside of you. Look inside yourself; everything that you want, you already are. The thought that we have to do something perfectly the first time is such a lie. If you love music and you want to be a concert pianist, the first time you sit at a piano or a keyboard, you are not going to play Chopin perfectly. Never abandon your dreams, just because they will take time and lots of practice to transform you into who you dream of being. You are more than your thoughts, your body or your feelings. You are a swirling vortex of limitless potential who is here to shake things up and create something new that the universe has never seen. The universe doesn’t give you what you ask for with your thoughts; it gives you what you demand with your actions. It is making choices by taking the scary actions that make our heart beat so loud that everyone can hear it. It is taking action, stepping on the stage of real life with the possible rejections, that will bring the universe into concerted action on our behalf. We might feel that we should just want to hold the dream in the safe mode, where no one can poke holes in it, or damage and dent it. But what is required in our actions, is to dig deep within us. To find that place of strength and conviction in our dreams. To mine for the gold, polish it up and display it for all to see. To keep walking across that stage even if our heart stops. Even if our entire body goes numb. Even if we don’t think we can take another breath, we inhale a deep breath and we keep walking. The universe buries strange jewels deep within us all, and then stands back to see if we can find them. The universe has shaken you, to awaken you. A couple of weeks ago I had this dream. I was driving down the 101 Freeway. I was exactly in the middle lane, with two lanes on either side of me. All of a sudden there was a car in my lane coming straight towards me, driving the wrong way. I jerked awake as I heard these words, “Wake Up”. I have thought a lot about this dream. I sometimes have these dreams where I know that my soul is speaking to me. That the divine is leading me. I know they have an impact and meaning in my life, although I am not always sure what. But they set me to looking for signs to their meaning. What I took from this dream is that a big change is coming into my life – but I will only see it if I am awake and ready to take advantage of it. As the weeks have passed, I think that I am seeing some possibilities of what it all means. Some possibilities that profoundly scare me, because they are such a leap from where I am at, and that is usually a good sign. She knows it’s time to make a change. She feels it on an energetic level that she can’t quite describe and maybe doesn’t even want to put into words. It is a personal and sacred language, an inner message between her and her soul. Relax. Let go of the expectations, Stop pushing what you want to happen, and release all anxiety. Trust in your dreams. Trust in the Divine. Know in your heart that sometimes impossible things just happen and we call them miracles. It happens when we let go of how we think it should work and just let it happen in the biggest, fastest way possible. Your best life is achieved by listening to the wisest part of you – what you know to be true. Come join us for our next "Conscious Conversation" program! What is a Conscious Conversation? It’s a conversation where we connect our soul’s voice to other soul’s voices. Where we turn down the volume of our minds inner voice with all of its fears, doubts, and worries. Where we turn up the volume of the heart and soul’s voice, so that our inner compass can point us in the direction that we should be going. We will talk about where we feel “lost” and overwhelmed in our life. We will talk about how we can use our Transformational Life Compass, to map out our dreams and bring them into reality. When we do this, there is a synergy that happens. Like one voice singing, then adding another and another, a harmony is created that is greater than any one voice. When we create this kind of conversation, we can tackle any issues in our life. We can see possibilities that we were blind to, when we were considering the issues by ourselves. We create that spark that flows from the hand of one divine soul to the hand of the next – and that is where the magic happens. Click below to get updates! I am married with 4 grown children who are all married and currently have 14 grandchildren and two great granddaughters. 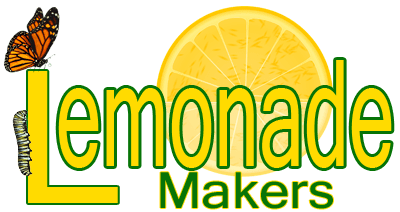 I work fulltime as a Director at Bank of America and I am the founder of LemonadeMakers.org, which is a website and Facebook page dedicated to personal transformation and growth. We all have life's lemons show up in our life, this website helps us to make them into lemonade.